Expanding on Rembrandt's excellent post about the future of housing, I'm going to continue digging into new (and old!) techniques for energy self-sufficient housing. This is an important topic because we often hear bloated doomer estimates of how much gas, coal and nuclear we're going to need to keep our civilization afloat. If housing can be retrofit and redesigned to minimize/eliminate the need for electricity and heating fuels, we're going to be well on our way to a bright future. The DOE (U.S. Department of Energy) has a great website packed with information on energy efficiency. 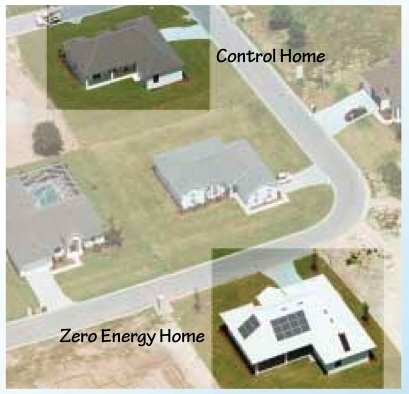 I'll be exploring this site further in upcoming posts, but today I would like to discuss some experiments the DOE has done on "Zero Energy Homes". The ZEH has a variety of efficiency features, both in terms of architecture and equipment: a 3-foot roof overhang for better shading, a reflective white-tile roof, better outer wall insulation, interior-mounted ducts which don't pass through the hot attic, solar control windows, high-efficiency appliances and lighting, programmable thermostat, solar water heating system, downsized air-conditioner and a 4kW PV (PhotoVoltaic) solar panel array. When all the numbers were in, the Zero Energy home performed extremely well. The results for June 18, 1998—a day with the hottest daytime temperatures ever recorded in Lakeland, Florida—tell the story. During a 24-hour period, the Zero Energy home used 72% less power from air-conditioning than did the control home, despite the fact that the occupied Zero Energy home maintained cooler indoor temperatures. 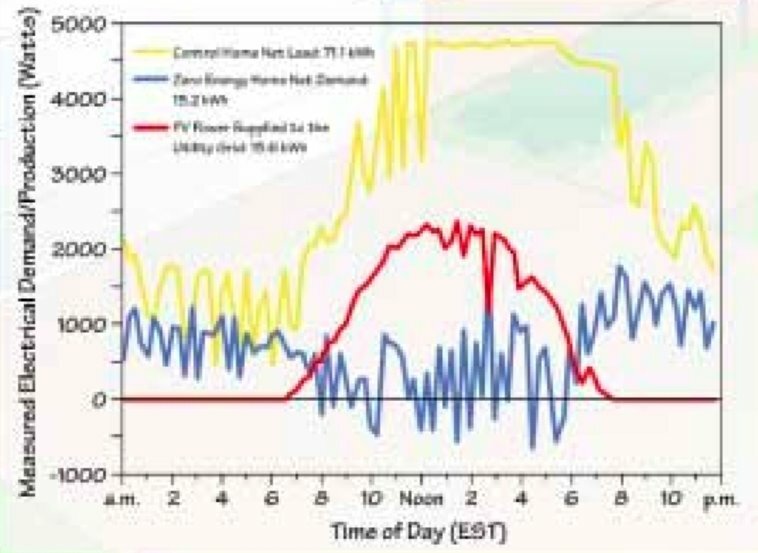 The yellow line indicates electrical demand of the control house; the red line indicates power produced by the solar array of the ZEH; and the blue line indicates net electrical demand of the ZEH. 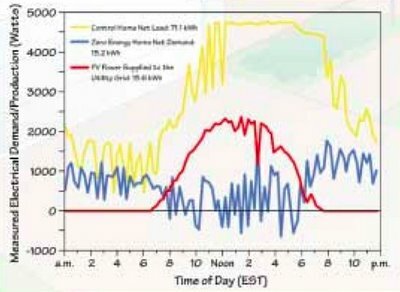 As you can see, there were numerous times -- during the hottest day on record in Lakeland, Florida -- when the ZEH was supplying electricity to the grid, not taking electricity from it. It shows that Jim Kunstler's gleeful forecasts about the death of Phoenix/Las Vegas due to lack of air-conditioning are unfounded hype. More broadly, it shows how we can greatly reduce -- and maybe even eliminate -- the need for fossil/nuclear power plants, as well as centrally distributed fuel oil and NG. And if we can do that we're going to free up a sh*t load of fuel and nuclear capacity for more important tasks. So here's the question for all you engineers, architects, visionaries and arm-chair experts out there: Is it possible, in principle, to design a true Zero Energy Home -- an affordable, comfortable home which requires no external fossil/electrical energy inputs at all? Let's get to work!! Great ideas. Just wondering, exactly how long will it take to retrofit all of FL, not to mention the other 47 continental states? And, for those on limited incomes, unlike the DOE, where will the necessary economic assistance come from? The DOE? The state of FL? The counties and cities of FL? Perhaps you can set me straight. From what I've read PV's are a net energy loser. AKAIK, it takes more energy to produce a PV, at this time anyway, than the PV will deliver in its working life. While JK may be a doomer of doom-mongering proportions, when it comes to US desert populations, without a massive effort and direct Government funding, the likelihood such venues will be awash with ZEH seems rather small. Unless, of course, you know something about the machinations of Washington we don't. I agree with "goritsas". The issue isn't really whether or not the solutions to the problem are available -- they are; the problem is whether or not the solutions can be implemented before the problem reaches a tipping point and becomes overwhelming. From what I've read PV's are a net energy loser. AKAIK, it takes more energy to produce a PV, at this time anyway, than the PV will deliver in its working life. According to the source below photovoltaics have EROEIs between 1.7 - 10.0. You're still thinking inside the box. The challenge is to conceive of home designs which are comfortable, affordable and require no external fossil/electrical inputs. It's not just about PV panels, although that's certainly part of it. Note that the DOE's ZEH has a number of low-tech features, like enhanced shading, solar hot water heating and a white roof. I imagine even the poor could improvise stuff like that in a pinch. Also note that the DOE ZEH takes the wasteful American approach of cooling the entire structure, so costs can easily be slashed by thoroughly insulating one or two rooms, and cooling them. Anyway, the point of the exercise is to be creative and open-minded -- blending high-tech ideas with low-tech cheapo ideas to get the desired result. You're still thinking inside the box. Yes, I am. I’m thinking inside the box that most of us currently inhabit. The box where the responses we have to the world around us tend to be limited. Where the options we’d like to employ are not the options we’ll get to employ. Thus, while a DOE ZEH is a good idea it is well beyond the reach of far to many. Not to mention the ZEH wasn’t done in mid-winter in Michigan. I imagine even the poor could improvise stuff like that in a pinch. I suppose what isn’t nailed down can be utilized, yes. Let’s hope it doesn’t come to that as a widespread method of acquisition. I missed the context of the exercise. Sorry. If you review the notes at the eroei.com site, you'll see that PV EROEI is actually between 5 and 30, if you take the quality of energy into account (electricity is 3x as useful as heat: nuclear/coal plants use 3 btu's for every 1 btu of electricity they put out; a geothermal heat pump extracts 3-4 BTU's from the ground for every BTU equivalent of electricity input. Similarly, transportation heat engines are only 20-35% efficient: 1/3 the efficiency of electric motors). According to this PDF from the DOE, "Based on models and real data, the idea that PV cannot pay back its energy investment is simply a myth." With the help of Greyhound, the poor can also relocate from Michigan to the temperate West Coast after the lease is up. There are all sorts of things that can be done. But what are the costs (pecuniary and non-pecuniary) involved? And I'm certain that capitalism will find solutions for people with money to spend, when the price is right. Until then, more global warming, acid rain, suburban sprawl, oil wars and biological holocaust. Back to my hot tub. The short answer is "no", obviously. If your conception of zero net energy loss is coceived from the ground up- that is, all the energy put into levelling ground, pouring a foundation, building the structure, and inhabiting it, the house would have to be a de facto energy generator. In other words, it would be an energy generator that you would live in, as opposed to a house that happens to generate electricity. Is it realistic to assume that a PV setup will produce more energy just sitting there than it takes to create all of its parts and continual maintenance? Take the conventional wisdom that a PV setup takes 10 years to pay itself back. What does the complete setup cost without compromising AC/Line power levels of on-demand comfort? Guesstimate $10,000 for a complete setup with enough capacity. After paying for the house (250k) and the setup (10k), the energy generated pays for itself at a rate of 1k per year. Therefore it would take 10 years to pay for itself, and another 250 to pay for the entire house. Over the course of 260 years, the house would probably need a coat of paint or two, a roof or three, and PV system repairs. With amortized upkeep cost at $100/yr., add an additional $26,000 and you're close to 300 years before the house's NET energy production starts to make economic sense- in $. If what you're suggesting resembles running every house in "island mode" then I think it's a bad idea, albeit possible. We get a much better system efficiency, and cheaper energy, by sharing the burden, i.e. exchanging energy with other homes/regions. Affordable? Well, that's a relative term. It depends solely on energy prices, I think. How long will it take? I'd guess 20-40 years. But it's important to realize that this is not a problem! Don't retrofit your home before you need to do modifications anyway! That way you avoid paying extra for unduly modifications to your home. You'd probably be making some modifications to your home anyway within the next 20-40 years, at which time you install the energy saving devices and kill two birds with one stone. As a result, the changes will be rolled out gradually, more or less in sync with existing power plants ending their service life and depleting of various fossil fuels. Your question about net energy production of PVs was answered above your own comment by John Marcos O'Neill (Thanx for the link). This is the sort of thing that ought to be phased in anyway. Actually, the phasing in of these technologies has been going on for awhile, but we're still seeing the early adopter phase. You don't want to go out and have everyone spend money right now to retrofit. Just putting a better product out there that is nicer, saves energy, helps the environment, is safer, more convenient will get the ball rolling. I think it already is. Small things the government does (like with the 2005 energy bill giving tax relief when you increase the amount of insulation on your home, just speed the process along. I'd say that the real bottleneck is lack of know-how in the construction industry. After making this comment, I'll probably post to my blog about this, but it won't come as a suprise to anyone that the construction industry is not thick with early adopters. Upgrading your lighting in either a commercial, or a residential setting absolutely make sense economically, because energy costs are bigger by a long mile than device costs when it comes to lighting. If you have a bulb that costs 2.00, and gets 10 watts better energy efficiency, it makes sense to pay the 2.00 for the better efficiency, even if you get the less efficient bulb for free. But it is rare in the industry to meet someone who can explain it properly. In an outsourcing relationship I am familiar with, the company had a $500,000 contract to perform some outsourced housekeeping services for a manufacturing facility. The manager over the housekeeping services, on her own initiative, started up a recycling program, selling off some of the scrap materials. The recycling program brought in $1,000,000 the first year, over twice the cost of the housekeeping contract. That $1,000,000 was going out the door of the manufacturing facility for years and years, but nobody thought to capture it. There are hundreds of examples where massive amounts of waste is going on, both in commercial, and residential situations. All it takes is for people to adopt the technology and apply it to their situation. Even if you don't make your house a net energy provider, reducing the energy use by even 10% is a great start. How expensive can it be to install white shingles the next time you need a new roof? Need a new furnace, buy a high efficientcy one. Seal up holes to the outside. Doing all of these thing will most definitely increase your R-factor by at least 10 points in an older home. I hate the doomer philosphy of "all or nothing". They don't seem to take into account that many little steps add up to just one big one. Nice observation about the "all or nothing" attitude of the doomer philosophy. It's nice and simple though; good or evil, black or white, status quo or doom. It doesn't take too much fine thinking to follow. There's a whole world of stuff which didn't make sense at 10$/bll, but makes a whole lot of sense at 60$/bll. Like you said, there's a lot of low hanging fruit, especially in America, where energy efficiency is quite low. The Florida example showed a 55% saving in electricity, without the expensive PV array (but including solar water heater, which should be mandatory!) That bypasses the whole discussion about payback time of PV's. The current level of energy waste in modern society is really the silver lining of PO: It's very easy to save energy! Up here in Canada we have the 'Energuide for hosues program' where you pay $100 to have an energy inspection which gives your house a energy rating. If you make improvements to the place which increase your score, you get corresponding grant money back from the feds. Apparently these grants are carbon credits or something like that. We have a 45 year old gas furnace that by just replacing with a high efficiency model (only about $600 more than the lower models), we will get at least $400 back in grants. "For the record: you can build wind turbines using power from wind turbines! The same goes for solar. As a matter of fact, I'm surprised no one has yet built a solar power driven solar panel factory in the Sahara desert..? The two main ingredients are sand and electricity!" Just wanted to say - "I'm in!" When and where are we going to do it? "...that to me is evidence enough that oil production will not fall off a cliff anytime soon. No one I've heard of, not even Colin Campbell, has made that suggestion." My guess is that world oil production will fall at about 4% per year beginning (? - I'll let JD make that prediction: - 2010). What I hear from your view, however, is that it will be a smooth descent. That is where I cannot agree. Some years there will be big shortages and some years you won't notice anything. Some times you will wait in line at the gas station and "usually" it will be no problem. Sometimes you will go to your local Home Depot and will be able to get the supplies you need and sometimes not. There will be something very Soviet in the air... How many years did they always have to wait for a car? because, producing, packaging and transporting all this stuff (insulation, paint, pv-panels, etc) recuires a lot of oil! "because, producing, packaging and transporting all this stuff (insulation, paint, pv-panels, etc) recuires a lot of oil!" Well, no. About 10-20% of the cost of capital items such as these is from fossil fuels (coal, gas, oil). Let's say we lose, say 25% of oil. That might mean a doubling of oil prices to reduce demand by 25%, especially for leisure travel, and usage by the poor. Keep in mind that oil is only about 40% of global fossil fuel use. A doubling of oil, (and probably other fuel prices, as substitution begins) would then increase the capital costs of alternative energy and conservation by 20-40%, not nearly enough to stop massive investment in those items. Now, the poor would truly suffer (higher unemployment due to commuting costs, elderly freezing in the dark, etc)...but a peak oil induced oil crisis wouldn't stop the investment in alternative energy needed to replace oil, and eventually reduce the cost of electricity and transportation back to something reasonable. Clearly, as has been pointed out, the idea of "zero energy homes" is zero energy not counting the upfront energy of building it. In terms of solar panels ( I happen to live off the grid so it's something I know a little about), a 4kW setup is gonna set you back 25k, minimum (~$4/watt plus inverter plus racks plus installation). The 10k estimate is way out of line. Around here, the average house sells for maybe 120k, so to add a 30k system bumps the house price up significantly. Actually, a group of Cornell students (I'm in the Ithaca area), recently raffled off a solar house they designed for a cempetition for 121k. It cost something like 360k to build, I can't remember exactly. Really, the way to go is conservation. Solar panels are an option for the wealthy. Noone else is going to put up the cash for a solar panel setup. Maybe the best energy bargain going are those cans of spray foam they sell by the checkout at Home Depot. Most homes lose most of their heat via air leaks, not because of R values. Although R values are nice to have, the first R is vastly more important than any other one. Your insulation is worthless if the warm air in your home is leaking out of cracks in your building envelope. If you want a book that's REALLY about low energy building that the poor can afford, see "The Hand Sculpted House" by Ianto Evans. No, these are not main stream houses and it's not clear that they're even legal, but it's one of the only building books I've ever seen that shows you how to build an energy efficient home, as close as you'll to zero upfront energy use for, say, 5 grand in a reasonable and thorough way. My fiance and I built one and it's worked really well for us, although we're now building a much larger, more energy intensive house. Well, the house will be close to zero fossil fuel use going forward but construction used lots of energy in concrete and foam, etc. I'm not sure what I am, maybe an optimistic doomer? I am smart enough, wise enough, and alert enough both to recognize that the incremental improvement you all are proposing can add up to enough to save our bacon, and to recognize that if we don't get lucky with megalomaniacal politicians, atmospheric chaos, and bureaucratic inertia, that there comes a point where even the best idea are too little, too late. Of paramount importance is that we ditch the idea that we will automatically prevail just 'cause we're so clever and have God on our side. The coming crisis is real, whether it's upon us now or 20 years down the line - and no thinking person can deny that fossil fuels are finite. So the question becomes, are you complacent? Do you spend your energy quibbling about whether this needs to be dealt with in your lifetime or your grandchildren's? Or do you take what steps you can, when you can, and tell the people who choose to ignore the problem to shut the hell up, 'cause you care more about your own grandchildren's future than you do about their selfish and short-sighted present? Just about every component of this "zero energy" home described here is still built out of products that require huge amounts of fossil fuel to produce and transport. And I doubt it's cheaper to build a home like this than a "conventional" home. You wonder if there are ways to build REAL zero energy homes, homes that have little to no materials costs and that perform much better than a piece of crap that still requires an air conditioner? There are some incredible technologies - remarkable for their simplicity and the fact that they replace materials costs with labor costs. Go to www.earthship.org and www.calearth.org. The earthship idea is my favorite - the home automatically heats and cools itself passively because of its orientation with respect to the sun and its huge thermal capacity - the thing's built out of 3 foot thick earthen walls and slightly underground. Additionally, the entire front of the house can serve as a growing area to help reduce dependency on agricultural products that have all been grown with fertilizers and pesticides produced by fossil fuels and subsidized by topsoil loss and aquifer depletion, then transported 1500 miles to our local supermarket. The home catches its own water and treats all its own waste. These homes are routinely built for about $40 per square foot.